Advantages: Long awaited and much needed treatment of this subject matter, superb coverage, great profiles. Now here’s a title that I wouldn’t have expected a few years ago…a book of this size just on Sopwith Triplane aces. The subject certainly deserves such treatment, as there have been many men that scored heavily in this innovative fighter. Names such as Collishaw, Little, Booker and Dallas readily spring to mind but there were also another 19 pilots that scored 5 or more victories in the type. Presented in the usual Osprey format, there are 96 pages, which contain a wealth of information. Norman Franks has done his usual thorough job of assembling data regarding the pilots and interspersing it with extracts from diaries, autobiographies, letters, and logbooks. Thankfully the pilots were allowed a lot of latitude in filling out the latter which makes for some stirring reading. Sensibly the book starts with a brief overview of the Sopwith Triplane and the introduction of Sub-Lt R S Dallas to the prototype. We find out about the unit markings employed by the RNAS and what the type was like to fly. All this is relevant and the author does not make the mistake of being distracted from the main focus of the book. Essentially the triplane was the mount of the Royal Naval Air Service and it is with “Naval 1” that the book begins its story. A welcome trend develops here where pilots talk about their experiences with the triplane itself, not just their combats. Another helpful piece is the paragraph or two on the markings applied to the “tripes” of the unit. The rest of the chapters look at the other RNAS squadrons such as Naval 8, 9,10 and the famous “Black Flight”. The French also get a mention as the Centre d’Aviation Maritime operated a few triplanes from St. Pol. Harry Dempsey contributes the artwork and very nice it is too. Thirty-six profiles are portrayed as well as numerous scrap views to complete the colour schemes. The photographs are a good selection but reproduction can only be as good as what the original prints allow. Thus there are some grainy but priceless images, for example Little’s N5493 “BLYMP”. Twenty of his twenty-four victories were scored in it. The appendices round out this nice package with plans of the triplane in 1/32nd scale. Also compiled are lists of the triplane aces/scorers, serial numbers, German claims and French Naval use. 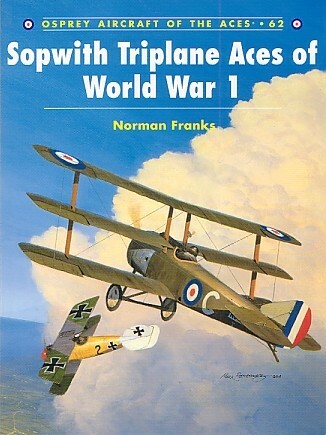 Published books with information regarding Sopwith triplane aces have been much neglected in the past. This book redresses some of the balance by taking a detailed look at the men that flew this versatile aircraft. The inserted passages from the pilots themselves are most revealing and make this one of the best books in the series so far.